Wow. Another contest right when I have a game suited to it. The difference between the current Component Ready and Contest Ready status is possibly moot. Hopefully playtesting will reveal that not as many components are needed as provided for in the print-and-play pdf allowing excess pages to be removed. No change in game mechanics is anticipated. Rules may be revised for clarity if needed. However, if no changes are made it should be considered Contest Ready vs Withdrawn. The size of the little souffle sauce cups is not critical - I chose the 2oz size because it had a lower price than the 1-1/2oz size. 2. Instead of the complex key on page 30 for economy points it might be simpler just to print values for all the planets on the board and say that you get +2 if it is your own home planet. Bear in mind colour-blind players, so maybe consider a design as well as colour for planets. 3. This might be a bit radical, but would squares (cubes) be easier than hexes for the map? Things like this are awfully complex: "Hyperspace jump destinations are determined by twisting the origin coodinates (X,Y,Altitude) so that (1,2,3) becomes (3,1,2) and then adding offset values to the new coordinate set." 4. With such a large map, it seems that ships are unlikely to end up in the same space unless there is a planet/base in the hex. Is there a simpler solution to movement that might lead from this? 5. Combat - I really don't think you need a wheel to determine fractions! OTOH, the fractions are very complex - I don't really see the point of them - do they just penalise the defender (and simultaneously boost the attacker) for having more weapons in an area? If so, aren't they already penalised by having fewer weapons present in the first place? 6. Combat - no option to flee? Ok... I tried reading your rules and couldn't get past half of them for one reason: there is a limit where a rulebook becomes way too thematic. Believe me, I dig your theme, I think it's awesome and you should stick to it, but it just transpires to the whole rulebook and makes it difficult to understand. When the theme is getting in the way of the game itself, it's maybe a good time to split them apart. I would recommend keeping the rules explanation plain and simple, relative to the mechanics and the components and, at the end, writting all the flavour text, with just an introduction to the theme in the very begining that gives you a good idea about what the objectives are and the end game conditions. Some rules separate out the flavour text into coloured text boxes, which keeps it distinct - and can also be used for examples and so on to keep the rules clean. 1. 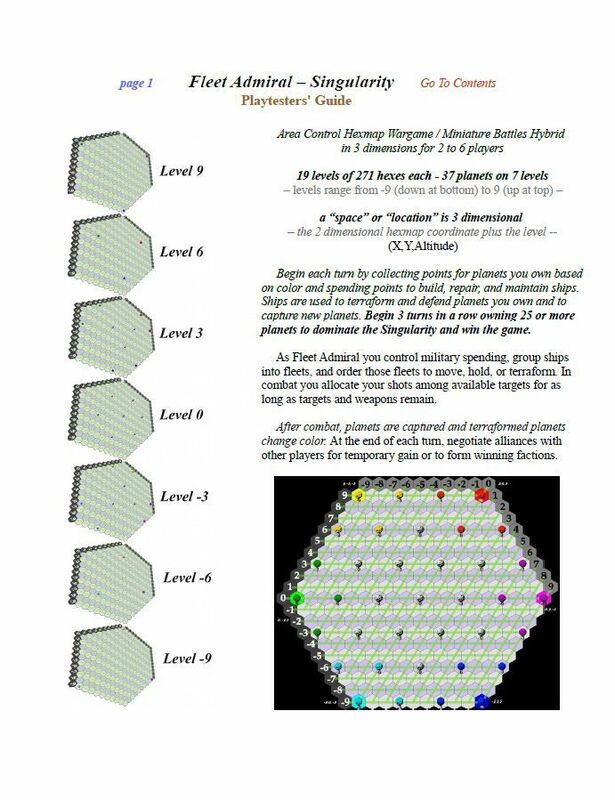 The rulebook needs better organised - it needs to start with simple concepts, such as how to move, before delving into detail - for example, this appears even before the contents: "Since shipyard to ship is only a stargate step away, ships may be repaired “in place” wherever they are as long as a Drive or Weapon unit remains. New ships can only be constructed at owned planets." I'd suggest a simple introduction to the theme. The current (I think this is around the fifth major revision now - these rules have been hammered at on Reddit and BGDF and here and a couple of other places already.) rules have a 1 page cover and a 2 page theme, followed by several pages of "what you find in the box" before you get to the contents. 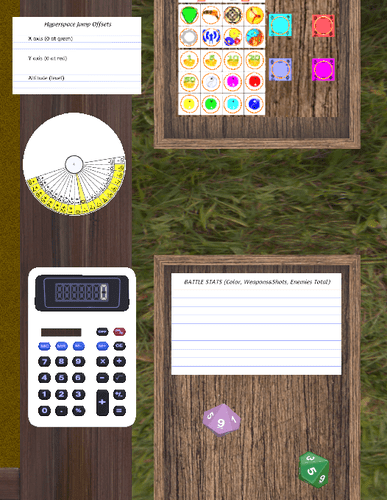 Since there is not an actual box full of stuff to look at, the playtester guide attempts to show the contents of the box, including the wheel (which serves no purpose other than keeping cardboard purists happy and was added after complaints) and an image of the game board. The theme is isolated to the 2 pages after the cover page (again as a result of feedback complaining that theme in the mechanics section made comprehension difficult) and even labelled "Theme" and put in yellow highlight. Everything before the contents can be skipped without affecting understanding the rules. No more than a skim and glance at the pretty pictures in what amounts to an introduction - before the content page even - was ever intended. 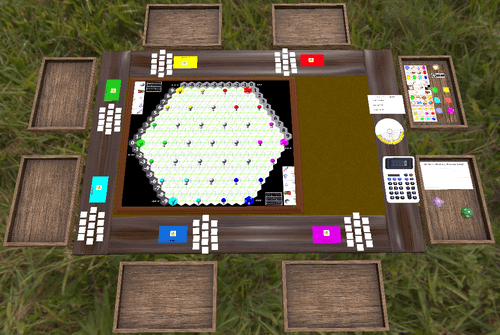 The issue of how to properly distinguish between the six "colors" and gray is beyond the current scope of the playtest prototype. But, if you look at the board you will see that the color values follow a pattern (closest 2 colors on map are 4 points, then gray as 3, then 2 almost opposites as 2 points, and opposite color as 1 point). People said they were confused when I stated the pattern, so I stopped stating it. The X and Y coordinate lines are at a 60 degree angle instead of a 90 degree angle but the twist part is the same in either case. It is possible to have an XY combination not on the map, so you cannot jump freom there, but if you are at the edge of the board there are directions you cannot move so it seems to be a balance. Hyperspace jump is not the primary movement method (and is civilian ship types only) but does give an extra bit of watch your back in the game. The offset values determined for each game makes the hyperspace jumps not always the same from one game to another (unlike its 1978 progenitor). Usually, a fleet would simply do its entire move - the segment by segment part processing the orders only comes into play when writing the orders and if an intercept seems likely when processing the orders. My opinion of the wheel is fairly clear in the wheel section (see page 17-20) but it was added as a result of complaints. However, the repair of dark ships to bring them back online is similar to a retreat followed by a regroup and attack. Did another proofread run - a couple of minor corrections,rewords, and highlight adjustments only. Have added the word "prefix" on the opening page and added "page 10" after Go to Contents in the link on the front page. 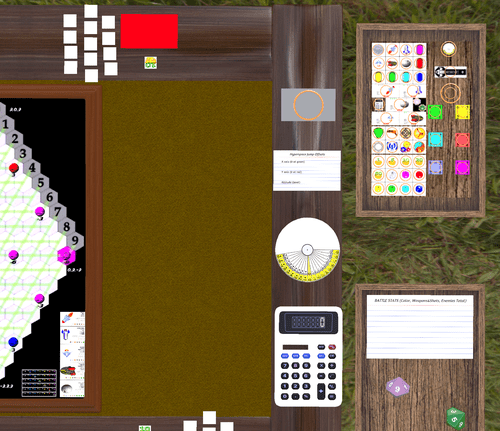 Still surprised that people did not realize the pattern for points and colors, but have added the pattern (based on home planet positions which have color coded spaces on the board) in the wording along with the pictures. Online links remains the same. Now it can be played without running out for paperclips and restaurant supply souffle sauce cups as extra game components. Some notes on the TTS implementation vs the print&play. First off, there may be a way to make a TTS object that acts like a souffle sauce cup in that it will hold chits, stack and move while holding chits, and even turn upside down to act as a stand for a chit or to cover chits. If there is, it is beyond the scope of my trying to make a useable TTS version - I used a bag with a modified image instead. So, instead of having the id in the top cup of a stack, the id goes in front of the "bag". In the combat arena, use a planet color marker instead of a cup as a base for a sensor chit to indicate "I have sensors". Damaged ships would be in their own "bag" inside the main "bag" (nested vs stacked). Not an exact duplication of the souffle cup stacks, but does allow the same "keep damage chits with the hull chit" method of avoiding tracking paperwork. 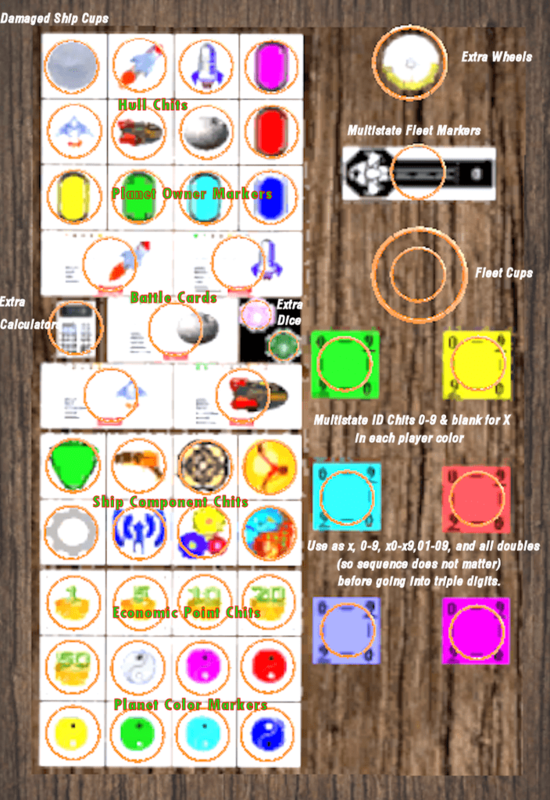 Infinite bags - imaged as orange circles - hold the various chits, etc. The fleet clips + altitude chit + ID chit have been replaced with a multistate fleet marker (19 states for the 19 altitude levels) and multistate ID chits (numbers 0-9 + blank). 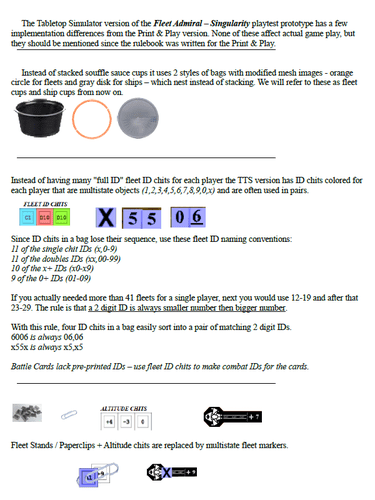 ID chits are colored for each player. Using a single chit gives 0-9. Adding a blank chit gives x0-x9 and adding a 0 chit gives 00-09. Nine more ID numbers are available as doubles 11-99 without going into a third chit or worrying about losing chit sequence causing id confusion among a player's fleets. A third chit (an extra blank) could be used if a single player actually had more than 39 fleets on the board at the same time. ID chits are also used to assign a battle id to the ship cards in the battle arena during combat vs having multistate ship cards. Extra calculator, dice, and hyperspace offset wheels are also available. The outer circular sliderule portion of the wheel is replaced by the calculator but the inner hyperspace offset part of the wheel is a multistate object for each offset value. 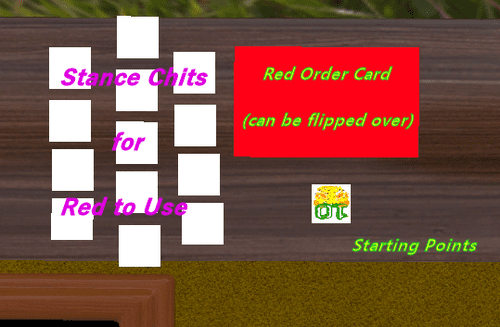 Each player has a planet owner marker on the board at their home planet, a 10 point economy chit, a set of stance chits, and an orders card to write on. Delete these for any color not playing. 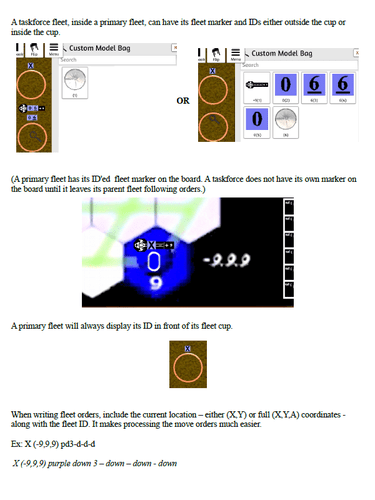 You may have noticed that each player has stance chits they do not need for their own color. Just delete those. Those bags nested inside bags are not as easy as stacks of cups that stay organized. It does get easier if we have a different bag for fleets than we use for damaged ships. Have now added one to the TTS version. 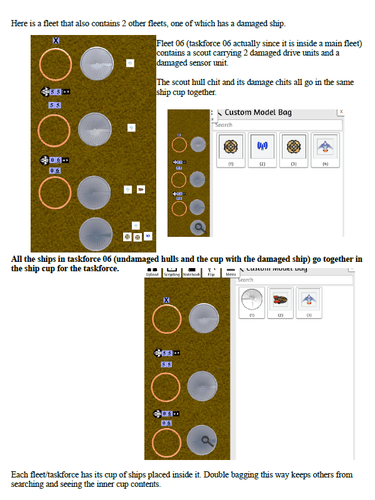 This way, each damaged ship (hull chit & damaged component chits) in a fleet is in its own gray disk looking cup (bag) while the fleet itself and any included task force fleets use the orange ring looking cups (bags). Broke down and made a 3 page rules addendum / differences supplement for the TTS implementation since rules are written for the print&play. Also got rid of the excess stance chits and flipped them face up. Stances can be "double bagged" using ship cups. Unselected stances can go in your tray, and selected stances on the table rim in front of you. The phantom stance chit always goes with the selected stance chits. If you flip the selected chits face down before putting them in their cup they will show face up when you search the cup but will drag out of the cup as face down.